It would have been the perfect end to an entertaining game, had only Montreal Canadiens forward Pierre-Alexandre Parenteau scored in the shootout like he was supposed to. Co-leading the league in shootout winners (Jonathan Toews; four), Parenteau didn’t exactly have the win on his stick Thursday against the Washington Capitals. He still could have put the Habs ahead in the third and potentially final round of the then-scoreless extra frame. Instead he missed his opportunity, failing to properly set up the showdown everyone really wanted to see: Alexander Ovechkin vs. Carey Price, the two most likely Hart Memorial Trophy candidates this season, only now it would be for a Washington win. It ended up quite anti-climactic in the end. Sure, Price stopped Ovechkin cold, for what seemed like the first time all night (Ovechkin had two goals in the game). Instead of securing home-ice advantage for the first round and tying a Montreal Canadiens franchise record with his 42nd win of the season (Jacques Plante, Ken Dryden), Price had to play another round of the shootout, ultimately watching Max Pacioretty miss and then missing himself on Troy Brouwer’s shot immediately afterward. Habs lose—despite scoring four goals in a game during which Carey Price was good, but not great, going so far as to take a delay-of-game penalty and having the Capitals score what would have been the game-winning goal late in the third on the ensuing power play (had P.K. Subban not tied it up three minutes later). Contrary to popular belief, there isn’t just one player on the Canadiens roster. There are 25 currently. And some of them are pretty good. Granted, Price, with his league-leading 1.95 goals-against average, league-leading .935 save percentage, league-leading nine shutouts, and, yes, league-leading 41 wins has become a legitimately elite goaltender over the past few seasons. But the thing about wins is the goalie only stops the puck. He doesn’t score. Well, Price doesn’t. Maybe the one thing left on his bucket list for this season? The fact of the matter is to win, the goalie needs goal support, and while the Habs are renowned for their ineffective offense, there is still some. And the goalie can’t always do it on his own. They need defense as well to clear the puck once they make the first save (and, in Montreal’s case, inevitably ice it… every single friggin’ time). Meet forward Max Pacioretty (yes, please do, Boston Bruins fans). He’s the forward with a league-leading plus/minus rating of +38. He also has 37 goals. Then meet P.K. Subban. He’s third in scoring among defensemen with 57 points (15 goals, plus/minus +19). Together with Price, they are Montreal’s version of the Holy Trinity. In any case, it’s also not just them, with other key members of the Habs contributing in one way or another. It’s just to illustrate that the narrative that Price is doing it all himself is a slight exaggeration… until of course it comes time to award the Hart, in which case a flip-flop on that position may be in order. Of course, for Pacioretty, Subban, and company to be able to contribute, they have to first be playing. The team currently has 78 games under its belt. So does Pacioretty. 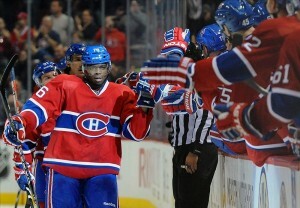 So does Subban. In fact, so do five other players, including core players Andrei Markov, Brendan Gallagher, and Tomas Plekanec. Meanwhile a total of 11 players have dressed for at least 70 games (not including backup Dustin Tokarski, who technically dresses every game, but in much the same way a stripper is technically dressed walking out onto stage; It doesn’t really matter… at least not for this specific purpose). In all, the Habs have lost a league-low 84 man games. The next-highest team is the New York Rangers with 114. The league-leaders in that category? The Columbus Blue Jackets (486), who were eliminated from playoff contention back in November (unofficially anyway). However, now with a quasi-healthy lineup (minus Jack Skille, David Clarkson, Rene Bourque, and Ryan Murray, so just Ryan Murray then), they have won eight straight. The Canadiens, meanwhile? They have never lost more than three consecutive games all year and are currently the only NHL team without a single injury to report. There just may be a correlation between the two (Fyi, Columbus lost nine in a row once this season, just in case you were wondering). 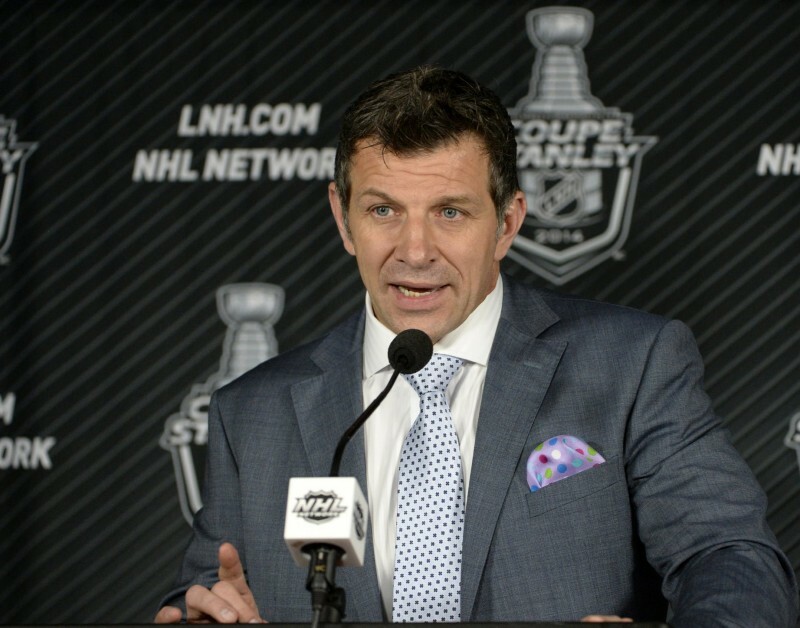 While health may be an overriding reason as to why the Canadiens have a realistic chance at winning every night no matter the opposition, the Canadiens wouldn’t be these Canadiens were it not for general manager Marc Bergevin. Sure, a few bit players would likely be here, including (mumbles) Pacioretty, Price, and Subban… or not, if you’re to believe former-Tampa Bay Lightning GM Brian Lawton. But, looking at where Vincent Lecavalier’s career is now and then those of the three Habs mumbled above, even the mere possibility of such a trade is enough to acknowledge competent general management is the cornerstone of any successful franchise. And Bergevin? He’s proven himself more than competent by a mile, despite being a rookie. There have no doubt been a few missteps along the way. But, with exception to Plekanec, who signed his six-year deal back in 2010 (Bergevin was hired in 2012), there isn’t one player on the roster that Bergevin hasn’t dealt with in some way: whether it be drafting them, trading for them, or resigning them, and that goes for Pacioretty, Price, and Subban as well, with Pacioretty and Price currently signed to especially cost-effective contracts. This is his team. Win or lose. Now they’re winning (in general, not in specific regard to Thursday night obviously). And he deserves all the credit in the world.